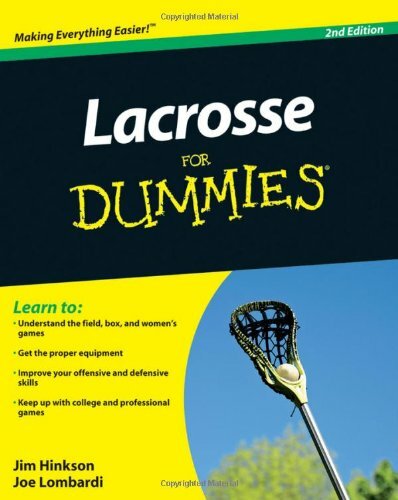 Lacrosse For Dummies is the end all guide for Lacrosse fans and players alike. The book provides expert advice of what the beginning player needs to know, from the necessary equipment to the basic rules of the game, with explanations of the women’s game and the indoor game, too. Additionally, Lacrosse For Dummies contains information for the experienced player, including winning offensive and defensive strategies, along with skill-building exercises and drills. For the fans of the sport there’s information on how armchair lacrosse players can get their fix of the sport on television, online, and in print. Learn How to Play Lacrosse in Style. Now on DVD is a real look at lacrosse from the lens of a fast-paced 16mm camera inside the pro game. This is not your everyday instructional video showing a rehash of boring drills and practice ideas. Watch some of the most exciting footage you will see of real lacrosse action, as you learn how to play lacrosse from the best of the pros. The greatest lacrosse players on the planet display their lacrosse skills through live action footage. Experience their passion of the game as they give you an inside glimpse of what it is like in Major League Lacrosse. For over 30 years, JPI has been defining the leading edge of sports production and we continue to develop award-winning programming that bears the style, energy and creative prowess that has beocme the hallmark of Jalbert Productions. TV production, film, dvd production & authoring, hdtv, video on demand, commercials, image videos, and feature films. Mark Millon: A four time Collegiate All American at U-Mass, Top Goal Scorer last with the Philadelphia Wings. Jesse Hubbard: MLL leader in Goals – All Time – Need we say more? Share the passion for lacrosse with today’s Lacrosse stars. This DVD shows the on field intensity of the game along with the off field antics of life in the MLL. This will be some of the best lacrosse footage set to high-energy music along with outtakes and a music video. Running time about 45 minutes.